Note: This product is not available for purchase on the internet, only in our retail stores. The 1000 Watt motor creates amazing airflow: 80 cubic feet of air per minute, making the S163 a perfect machine for small apartments and city lofts. The simple, maneuverable design makes vacuuming quick and easy. Made from the same material used in football helmets, our lightweight ABS casing is very strong and exceptionally durable. Other materials could be used, but at Miele, quality comes first. A small example of the details that make a vacuum cleaner a Miele. The engineers at Miele recognize that different people have different needs. That's why they let you decide which type of filter you need. The S163 comes equipped with a double-layer dustbag, a pre-motor filter and an advanced electrostatic, Super Air Clean Filter. This filter is designed to remove microscopic dust particles from the exhaust of the machine. Optional certified H.E.P.A Active Filter is available to remove 99.97% of all particles as small as 0.3 microns in size, eliminate odors and filter exhaust air. The completely sealed system is designed to help improve suction and filtration. By having tight joints and rubber seals, Miele vacuum cleaners keep the dirt and dust where it should be -- in the machine. Designed for a variety of carpeting and smooth flooring, the combination floor tool can be adjusted depending on the flooring you clean. Soft bristles gently sweep smooth flooring and thread lifters help remove surface lint from carpeting. The S163 also includes an upholstery tool and crevice tool. A convenient two clip quick cord release system holds all 26 feet of cord when not in use. A simple twist releases the cord for use. 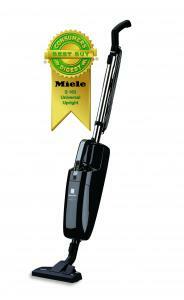 Consumers Digest recently rated both the Miele S 5280 Callisto canister and S 163 Universal upright vacuum cleaners as a Best Buy. For over 48 years, people have trusted Consumers Digest magazine to identify outstanding values in a complex and often confusing marketplace. Consumers Digest defines a Best Buy as a product that offers outstanding value for its price and that merits special attention from consumers. It is awarded to nationally available products that Consumers Digest considers to have a great value in the marketplace.